Despite this poor performance year to date, the S&P 500 index climbed to a new all-time high just a couple of weeks ago when it hit 1,878 on 7 March (based on daily data). Adjusted for CPI, the index is now higher than the peak from the last bull market which ended in 2007 and is now only lagging the record high from August 2000. 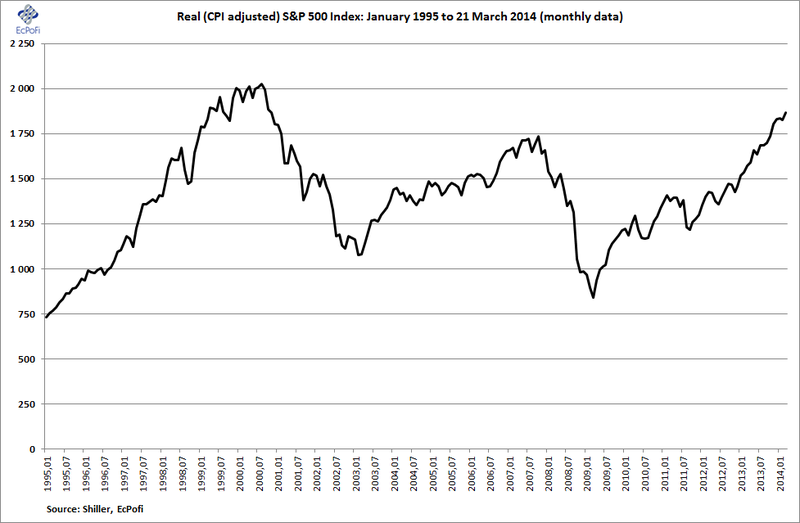 The price return for the index was just short of 19% in real terms during the last twelve months with about 6% attributable to earnings growth and about 13% coming from an expanding P/E multiple (both based on 10-year rolling average real earnings). 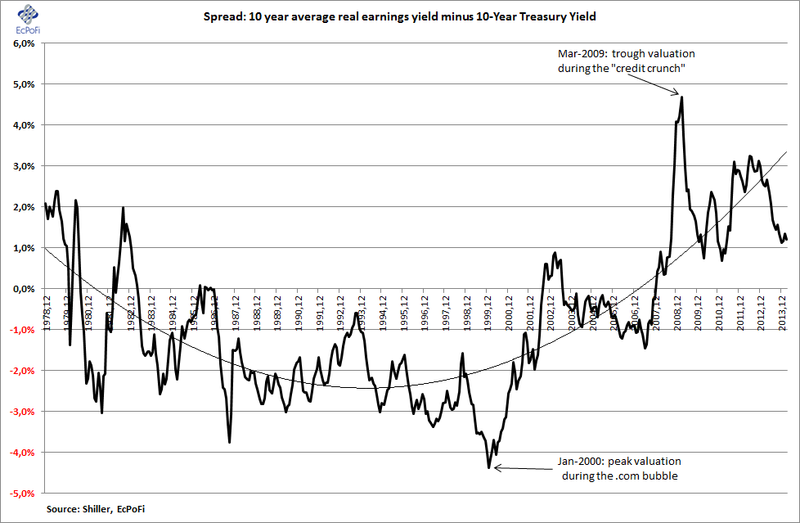 The 10-year average real earnings yield is currently 3.97%, the lowest reported since December 2007. 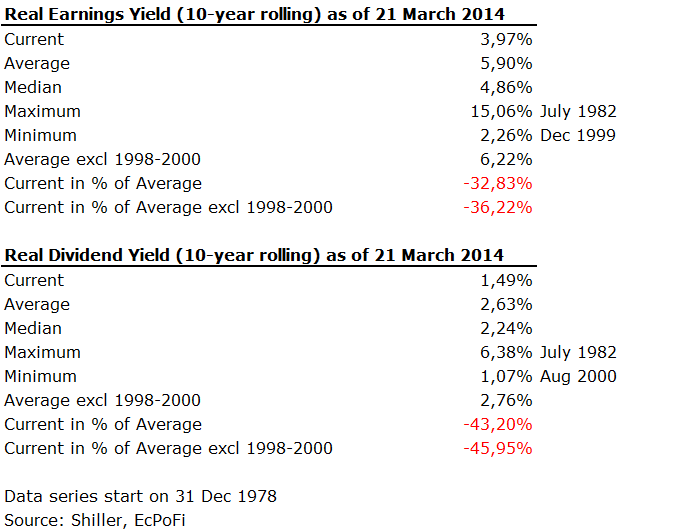 This is 32.83% lower than the 5.90% long term average since 1978. 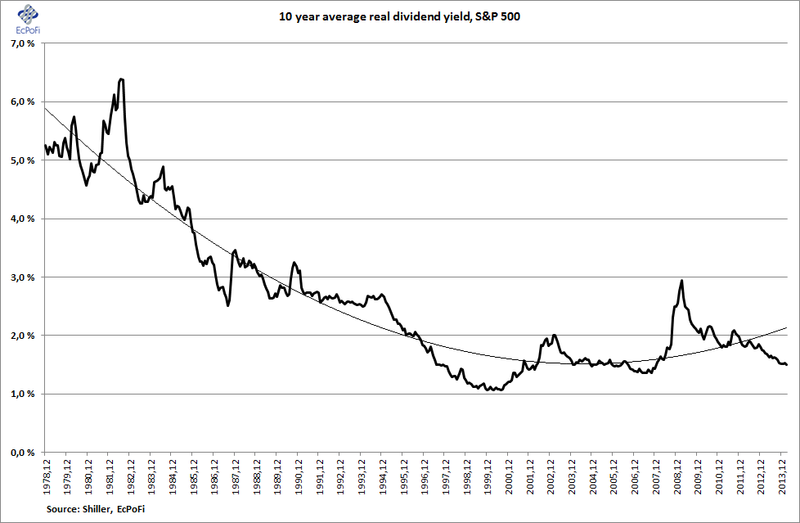 The 10-year average real dividend yield currently stands at 1.49%, also the lowest reported since December 2007. 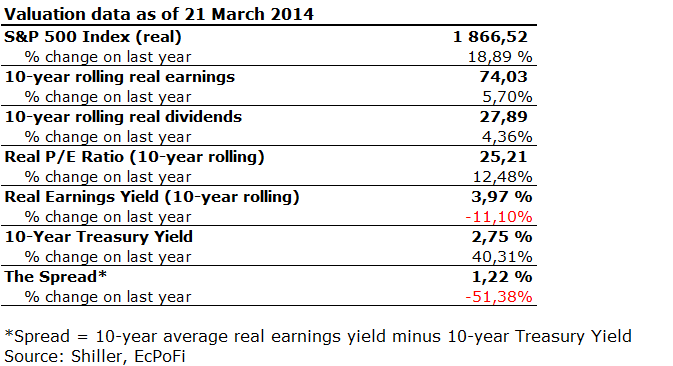 The current dividend yield is 43.20% lower than the longer term average since 1978 which is even lower than that for the earnings yield reported above. 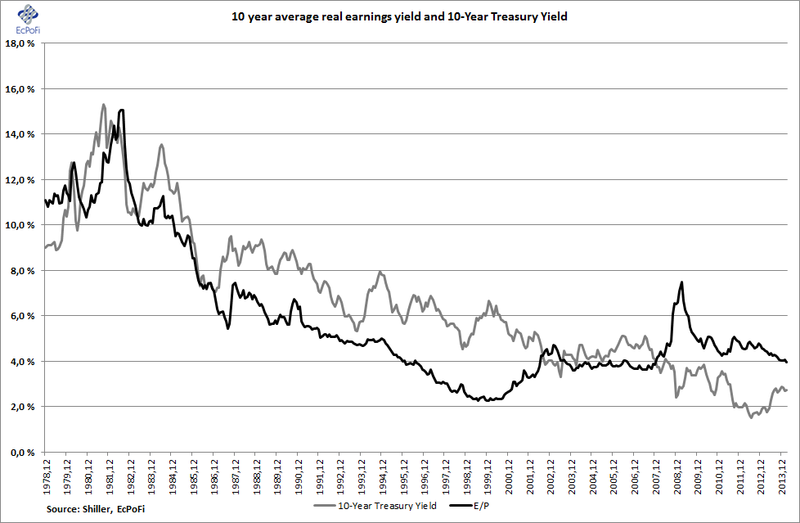 The spread, the difference between the 10-year average real earnings yield and the 10-year U.S. treasury yield, has increased slightly during the last three months or so as the treasury yield has declined. 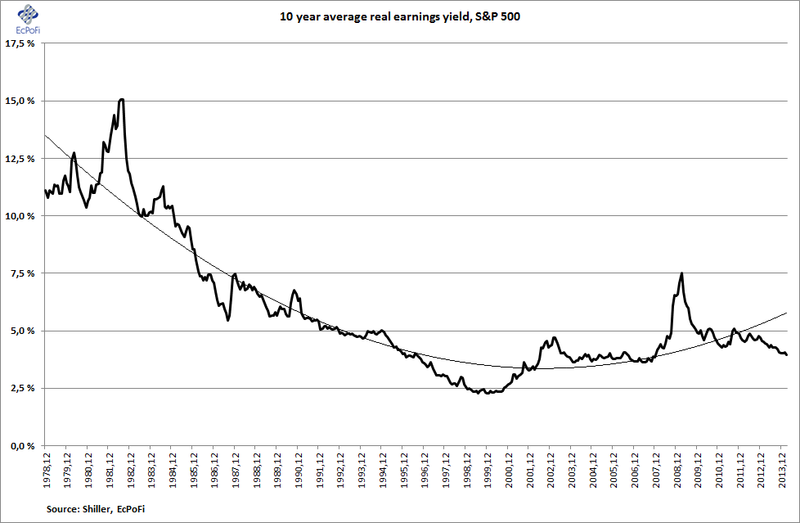 The spread remains high in a historical perspective, driven by artificially low interest rates (and not due to the earnings yield which has been substantially lower than average for more than four years now). InÂ the final earnings yield report for 2013, I wrote that the Federal Reserve had managed to create a stock market bubble yet again. The previous ones peaked in 2000 and 2007. It’s now 2014 and we’re once again at the end of another seven year period and virtually all the valuation indicators I follow on a regular basis are flashing red (seeÂ hereÂ for some of them). Combined they suggest a high probability that a major stock market correction is due. At best, stock market returns over the next few years will be poor. Not much has changed therefore since the end of last year. WhenÂ the U.S. stock market plummets again depends, in my opinion, primarily on the money supply growth rate.Â As the Fed has, effective this coming April, tapered the monthly asset purchases by $30 billion this year, from $85 billion to $55 billion, the burden of generating money supply growth is increasingly being passed to the depository institutions (primarily U.S. commercial banks). They have plenty of excess reserves to expand their lending rapidly, but if they will actually do so and if the demand for loans is sufficient is not immediately obvious. They might instead just settle for becoming the marginal buyer of treasuries, a role dominated by the Fed post Lehman (September 2008). What is then required to keep the money supply growing at around 6%+ going forward (the average year on year growth rate in 2013 for M2 money supply)? At the end of 2013, the M2 money stock was just north of $11 trillion. A minimum expansion of $663 billion, or $55 billion a month, is hence required in 2014 to keep the growth rate at around 6%. If the Fed tapers another $10 billion every month, the QE program will end in October resulting in the Fed having expanded its balance sheet by $385 billion this year (through monetizing government and agency debt). The rest of the “required” money supply growth, $278 billion, hence need to be generated by the banks (and other depository institutions). This would represent a significant increase in bank lending and investments as bank credit has expanded by just $182 billion since the end of 2012. It is my position (I’m certainly not alone) in expecting the Fed to rapidly reverse any tapering and instead increase asset purchases at the first sign of the financial markets starting to lose their legs and/or if interest rates surge. The latter would also result in the U.S. government struggling just to pay interest on its ca. $17.5 trillion debt outstanding. As the Fed can print money to bring interest rates down again, it (probably) will. In summary, the U.S. economy need an ever expanding money supply to keep the illusion of economic growth alive. At the same time, the more it does exactly that the deeper into debt it goes and the bigger the ultimate and necessary correction.Â There is no painless cure for this financial and economic mess (so policy makers are busy kicking the can further down the road) – a government can print itself into problems, but never out of them.